← We’re in the money, the skies are all hunney…we got a lot of what it takes to get along!!! History’s witchy women whisper to the lazy Kings and the Magnificent ONE HIMSELF: Oh!! mon beau type, au reste, reste, après nous le Deluge, toujours après nous.. 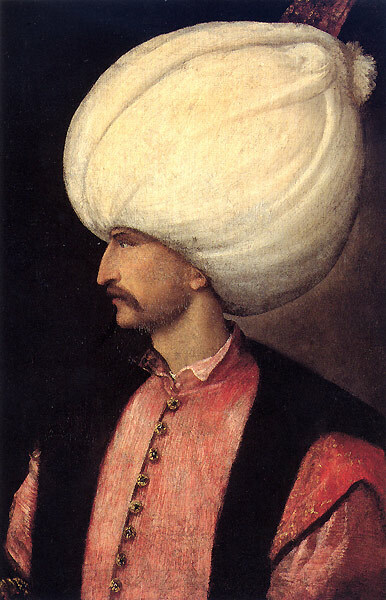 Above, at top, Suleiman I (1494-1566) was the tenth and longest-reigning Emperor, Sultan, of the Ottoman Turkish Empire, from 1520 to his death in 1566. Suleiman was by far the greatest leader of the Ottomans and also known, in the East, as Kunani, The Lawgiver. To the Western historians Suleiman is “The Magnificent One.” As Sultan, Suleiman of course did not lack for the feminine comforts, but like many boys before him and after in history, he could not resist the blandishments of a girl who was strangely bred. 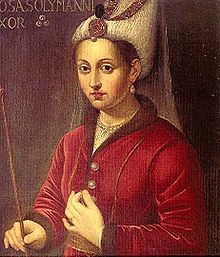 His itching addiction, a Russian slave girl, called by him Hurrem Sultan, Roxelane (seen below him pictured), so named, as she was head of the Imperial Harem of concubines, she, nee Aleksandra Lisowska, born in Rohatyn City of the Kingdom of Poland in a day when Russia belonged to Poland, a sharp reversal of the more recent relations between those nations. Startlingly conniving, even for a Russian, and with red hair no less, Roxelane not only out-performed the other harem girls in her harem duties–she got a large ring and a Mrs. degree in the bargain!! He fell, hard and long for the slave girl and, while he never knew it, and died as he lived The Magnificent One, who ruled the Osmanli Empire with personal magnetism, power, strength and brilliance, that one misstep with the Russian slave girl put the Ottomans who followed Suleiman into a long death spiral which finally ended, as did all other civilization of any consequence, after The Great War, 1914-1918. Below, Louis Quinze et Jeanne Antoinette Poisson, Marquise de Pompadour, also known as Madame de Pompadour (29 December 1721 – 15 April 1764), was a member of the French Imperial Court and first-call party doll to Louis XV from 1745 until her death. 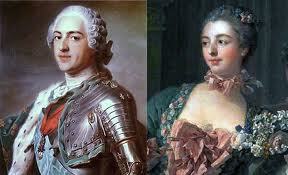 As can be seen, Jeanne Antoinette et Le Roi, Louis Quinze, lived a pretty cushy life dans La Chateau de Versailles, but, somehow, Jeanne Antoinette had that sinking feeling that one day the axe was going to fall, or, at minimum, somebody was going to break all the Louis Quinze furniture. Grown tired of baby talk reassurances, finally she whispered truth to Louis, on their silk upholstered chair, Qu’est-ce que ca peut faire? Je pense que, après nous, le Déluge. A terrible!! Madame de Pompadour either did, or did not, say to her King and consort Louis XV, “Au reste, reste, après nous, le Déluge, toujours après nous.” If or no Madame ever said this, she was certainly prescient both in an immediate and far longer historical sense than she could have ever imagined. After Louis Quinze, came, swiftly, Madame La Guillotine. Heads rolled and a new regime emerged, and, as with most new regimes, the Reign of Terror was far, far worse than what it replaced. That Reign of Terror was merely a herald of the true horror to come after it. The Great War, a century or so farther on from the Terror, ended modern civilization. This is beyond responsible dispute of any kind. All the horrors let loose by the collapse of monarchy and empire in that war that have been visited upon us ever since; Mr. Stalin, Mr. Mao, Mr. Hitler, Mr. Castro, Mr. Pol Pot and myriad less murderous players, were presented and bequeathed their capacities to raise hell by the collapse of civilized order and society occasioned by the end of the Great War. Of all the Kingdoms and Empires to succumb to the ravishes of the Great War, one given comparatively short shrift by today’s historians, is that of the Ottoman Turks. Today, I delight in bringing to you the follow quotes respecting the glory, decline and collapse of the Ottomans, penned by a fellow called G.J. Meyer, he in turn introduced to us from the fellows at delancyplace.com, who daily bring us, gratis no less, some occasional gems of inspiration. The Great War destroyed what had long been called the civilization of mankind. All that has followed, all the horror, dislocation, disruption is but a post script, a mere annotation, to the grim result of that war. Mankind was cut adrift, never to find firm and steady shore again. The Great War put mankind over a ravine and all subsequent history has simply recorded the ever-increasing velocity of that disaster and fall. In that context, we are very thankful today for the book penned by our Mr. Meyer called by him A World Undone: The Story of the Great War 1914 to 1918. I have yet to read Mr. Meyer’s work in the full version but I will say here that if the follow quotes embodied here are any indication, it is full worth the price of purchase at suggested retail, likewise annotated at our closing here today, from amazon.com. A bit of history will prove useful at this point. The First Great War left many things in its wake when it groaned to an exhausted end in 1918. I deliberately say “end” and not “conclusion” because more was left unresolved than resolved, particularly regarding the formulation of new national boundaries and the dissolution of three great, yet by then antiquated, empires—those of Russia, Austro-Hungary and the Ottomans. It is the dissolution of the Ottoman, or Turkish, Empire which is of interest to us because with its dissolution, came helter-skelter, the unleashing of some of the most fanatical and barbaric brands of Mohammedanism the world has ever known. To be sure, the Ottomans were themselves fascistic and of a strongly fundamentalist religious bent. However, they kept a certain order in the lands then known simply as Persia to the Western mind. From its founding in AD 1299, until the end of the First War, the Ottoman Empire was a ruthless, yet comparatively stable state. After the war, the pent-up fury of those forces kept in check by force from the Ottomans, sprung free. Their freedom is our scourge today. It is those forces, loosely drawn together, which comprise the front-line threat to the modern world. “Suleiman, a contemporary of Henry VIII of England, took his strange heritage to a peak of vitality. Like his forebears, he was a warrior, personally leading his army in thirteen campaigns. He pushed deeper into Europe, capturing Belgrade and Budapest and completing the conquest of the Balkans. He besieged Vienna, the keystone of central Europe, and would have captured it too if torrents of rain had not made it impossible for him to bring his heavy guns north. He was a poet, a student of the works of Aristotle, and a builder who made Constantinople grander and more beautiful than it had ever been. The opulence of life in his Topkapi Palace beggars the imagination. “Suleiman had some three hundred concubines, as well as a promising young son and heir named Mustafa, when he was given a red-haired Russian girl named Ghowrem, who came to be known as Roxelana. She came into his harem as part of his share of the booty from a slave-gathering raid into what is now Poland, and she must have been a remarkable creature. (Not surprisingly, in light of the power she acquired in Constantinople, she eventually won a second new name: ‘the witch.’) Almost from the day of her arrival, Suleiman never slept with another woman. Eventually and amazingly, he did something that no sultan had done in centuries; he married. Their love story would have been one of the great ones if it hadn’t ended up taking the dynasty and the empire in such a sordid direction. “Mustafa gave every indication of developing into yet another mighty branch on the family tree. At an early age he showed himself a bold military leader adored by his troops, a capable provincial governor, and a popular hero. But he stood in the way of the son whom Roxelana had borne to (presumably) Suleiman, and so he was doomed. Working her wiles, Roxelana persuaded Suleiman that Mustafa was plotting against him. (He was doing nothing of the kind.) With his father looking on, Mustafa was overpowered and strangled by five professional executioners whose tongues had been slit and eardrums broken so that they would hear no secrets and could never speak of what they saw. And so when Suleiman died some years later, master of an empire of almost incredible size and power, he was succeeded by Roxelana’s son, Selim II. Nothing was ever the same again. “Selim the Sot was short and fat and a drunk. He never saw a battlefield and died after eight years on the throne by falling down and fracturing his skull in his marble bath. His son, Murad III, was also a drunk and an opium addict as well; during a reign of twenty years he sired 103 children and apparently did little else. His heir, Mahomet III, began his reign by ordering all of his many brothers, the youngest of them mere children, put to death, thereby introducing that custom into Ottoman royal culture. Having done so he followed his father in devoting the rest of his life to copulation. And so it went. Every sultan from Roxelana’s son forward was a monster of degeneracy or a repulsive weakling or both. The abruptness and permanence of the change, the sharpness of the contrast between the murdered Mustafa and his half-brother Selim II, has given rise to speculation that perhaps Roxelana’s son was not Suleiman’s son at all. “In the post-Suleiman empire, a new breed of craven sultans came to live in terror of being overthrown by rivals from within the dynasty. Appalling new traditions emerged, to be observed whenever one of them died. All the women of the deceased sultan would be moved to a distant place and kept in even deeper solitude for the rest of their miserable lives. Any who happened to be pregnant would be murdered (generally by being bundled in sacks and drowned), and the younger brothers and half-brothers of the new monarch (often a large number of men, boys, and infants) were murdered as well (generally by strangulation). Publisher: A Division of Random House, Inc.